Buffy and I are almost through hiking on Eagle Mountain for a while. Turkey season begins on April 9th, and it’s a favorite place for turkey hunters. There’s only water in the creek when it rains, so water will become scarce. Then there’s the healthy rattlesnake population. Buffy doesn’t know to watch out for them. I’m basically chicken when it comes to them. My son, Davis, drove up on the mountain last spring near the first of turkey season. He timed his trip (not intentionally) to hit it just right to see snakes crossing the road. He saw 7. While stopped, one kept striking his truck tire. I drove up there after he told me all this. I figured I’d be safe in the truck. The snakes had gotten where they were going, and I didn’t see a one. Anyway, on this trip, I just moseyed along taking pictures of this and that. 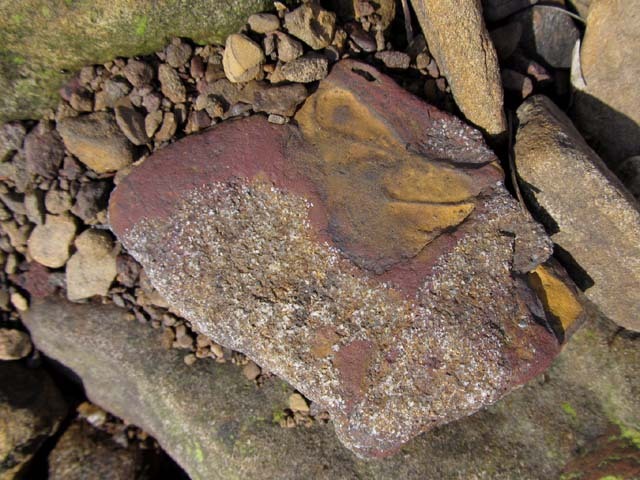 This rock has both red and yellow ochre, a by-product of the iron in the sandstone. 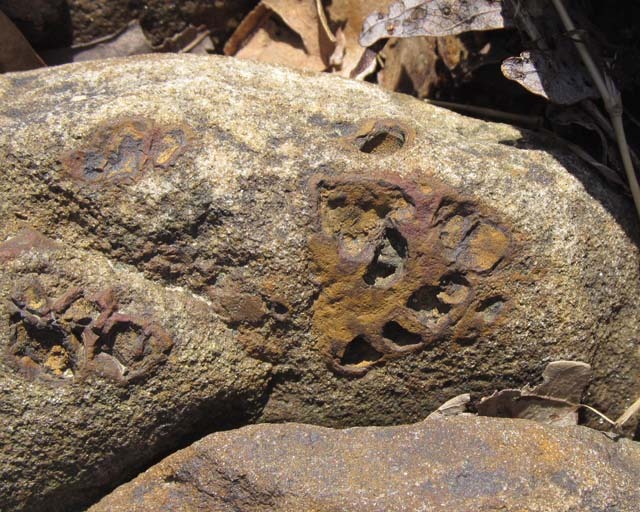 For some reason, I really liked conglomerate rocks (rocks in rocks). The first rocks had to become rocks, and then they ended up on other rocks. 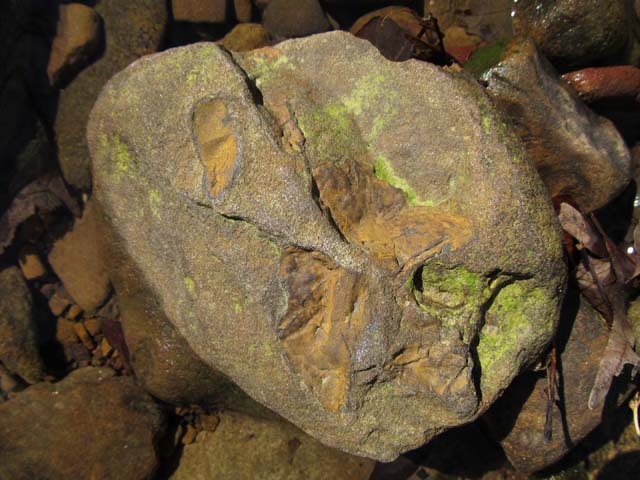 The lime green is dried algae. The mustard color is yellow ochre too. 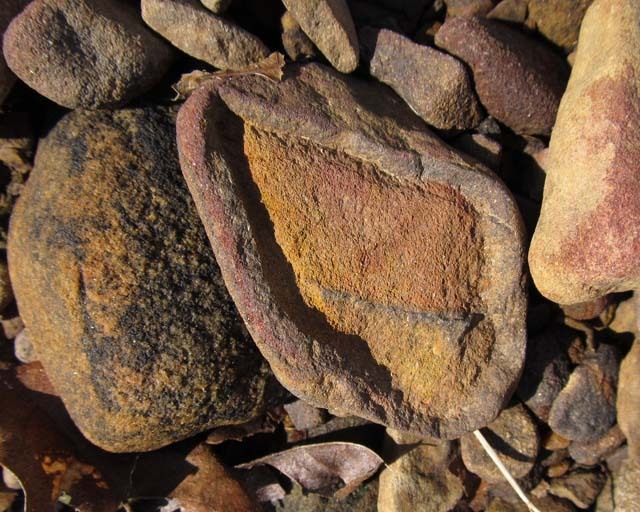 Rocks offer endless designs, sizes and shapes. 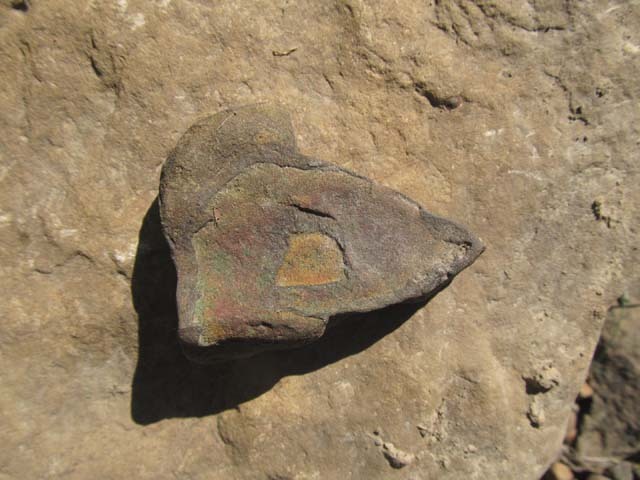 The raised pattern in this one is from the iron in the sandstone. It can be quite dramatic at times. And one of my favorites — petrified wood. 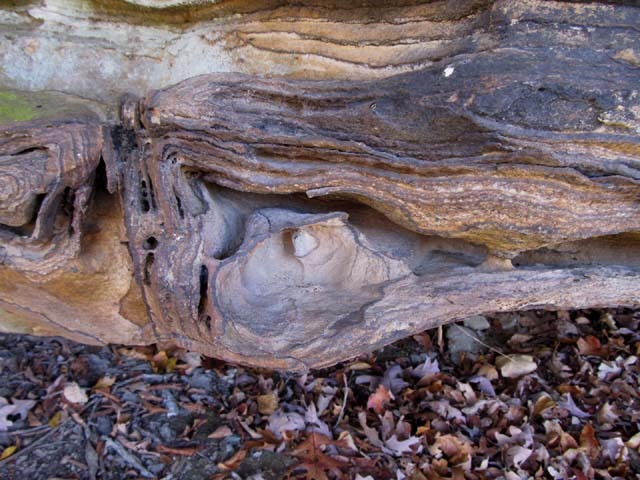 The brownish-yellow streakish lines is the petrified wood. 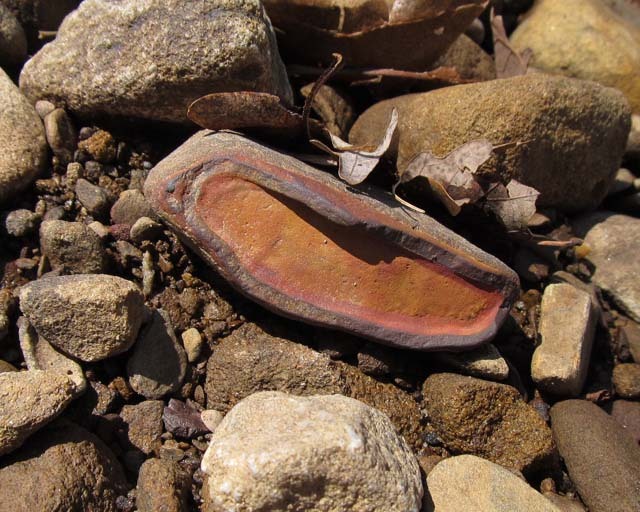 This rock shows a different preservation of petrified wood. More iron designs with the ochres. This iron “container” was filled in with ochre. Ochre will rub off on your finger. 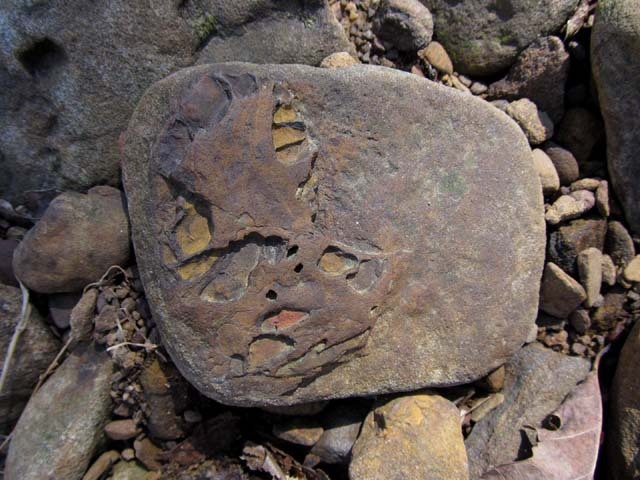 I’ve read that Native Americans would grind the ochre, mix it with animal fat and then paint a design on a rock. Over time the iron would leach into the stone and the picture remain. 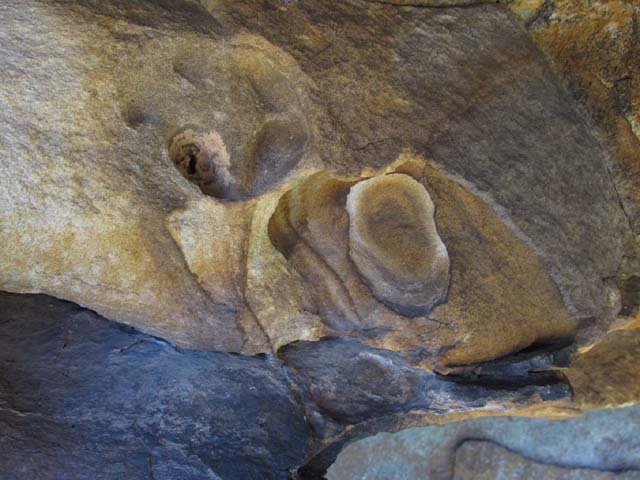 Pictographs are drawings or a painting. 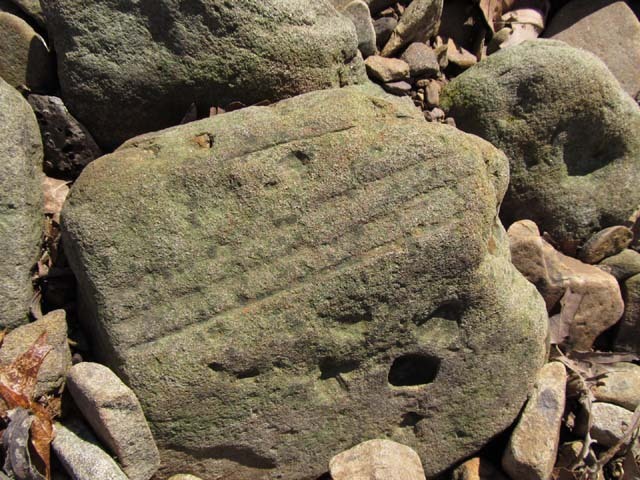 Petroglyph images are carved. 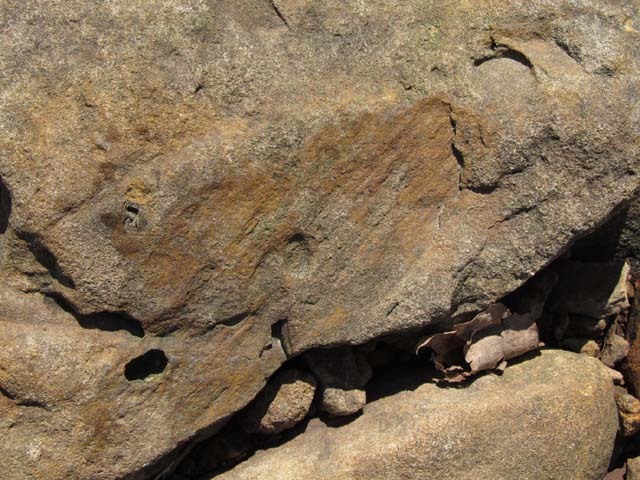 One site on our Shawnee National Forest has one such pictograph, called “buffalo on the rock.” Vandalism has taken its toll on the buffalo. I didn’t mean to get into that. 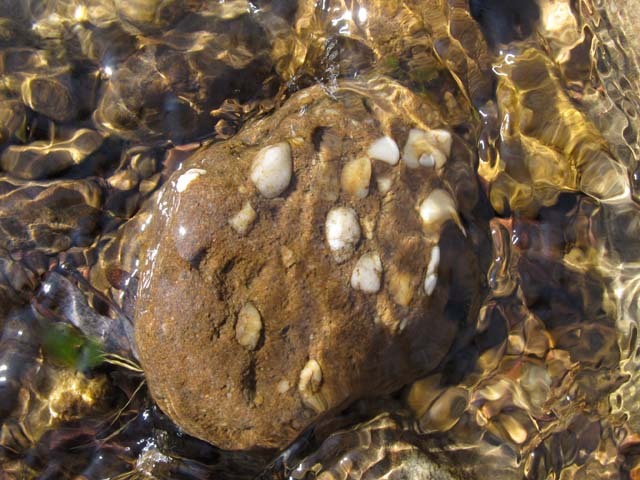 As for the rocks, I could walk this creek and never cease to be amazed by their variaties. 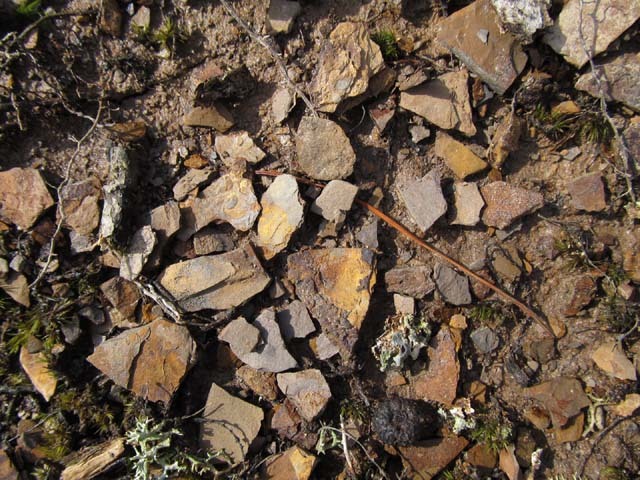 There are limestone glades, sandstone glades and even shale glades. 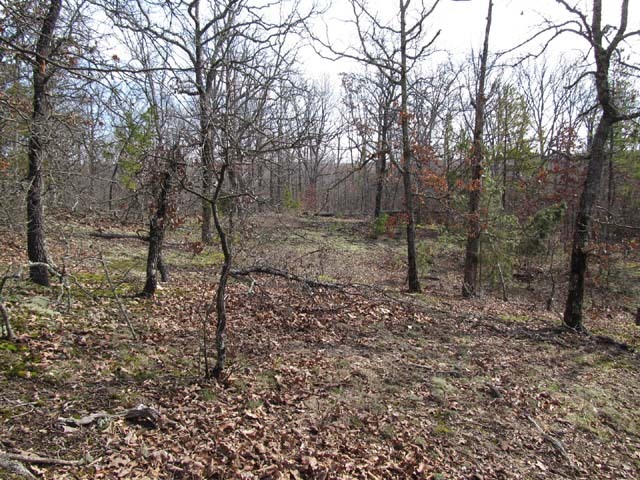 This one is a shale glade. 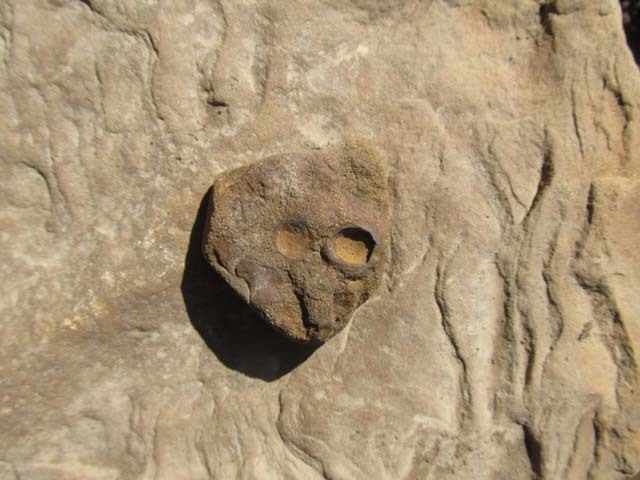 You can tell by the shale on the surface. 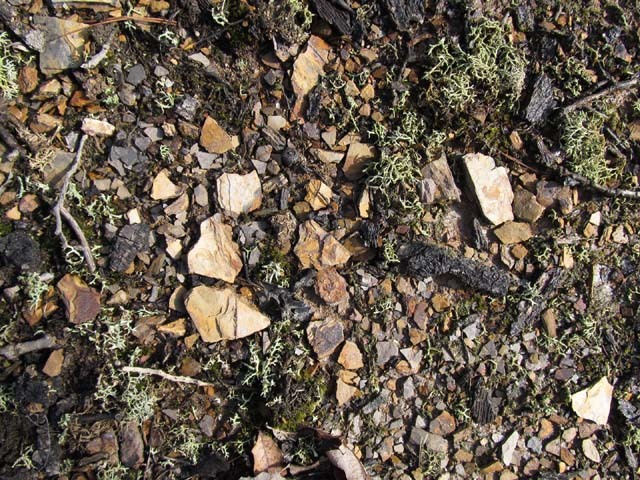 Glades are determined by the amount of rock at the surface. and not on the surrounding hills. Now comes the exciting part: This glade is the only one of its kind in North America! 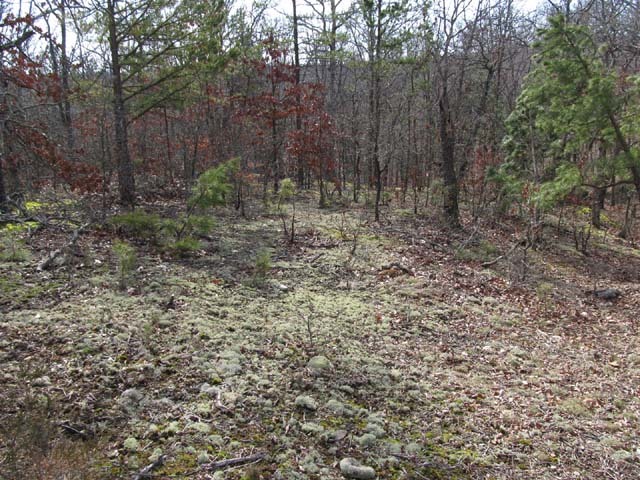 There is shale on other glades, but it isn’t the same age as the shale on this one. Glades the age of this one are so rare that they’re considered a globally endangered plant community! … crafted by the elements of nature. I was way more than impressed (and highly excited). Impressed enough that it will take 3 blogs to show off all their intricate work. 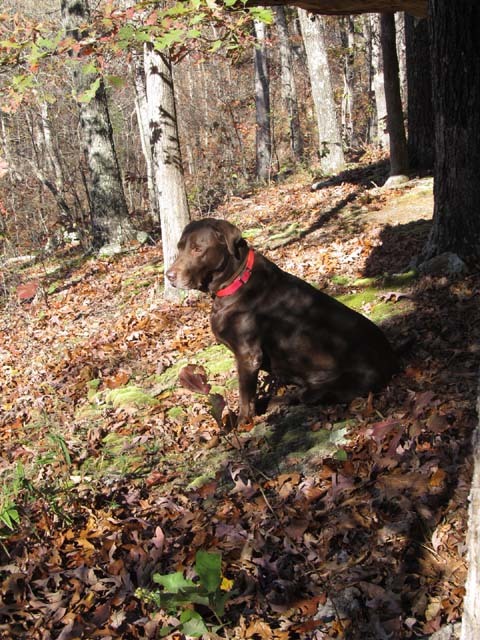 As my followers know, Buffy and I often hike up a creek on Eagle Mountain. The creek narrowed the higher we went. At one point it made a sharp bend, and was much narrower up from there on up. The rocky slope on the right side rose dramatically, which is one reason I’d never hiked up to this short narrow bluff. If you look on the left side of the picture, you can get an indication of the slope. It was worth the climb! 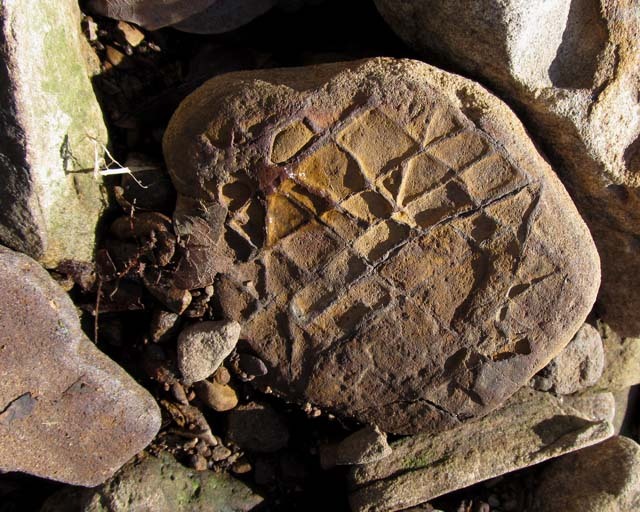 Iron in the sandstone created the patterns. These are called liesegang bands. A lot of creativity when into these. and inspiring. The word awe came to mind. 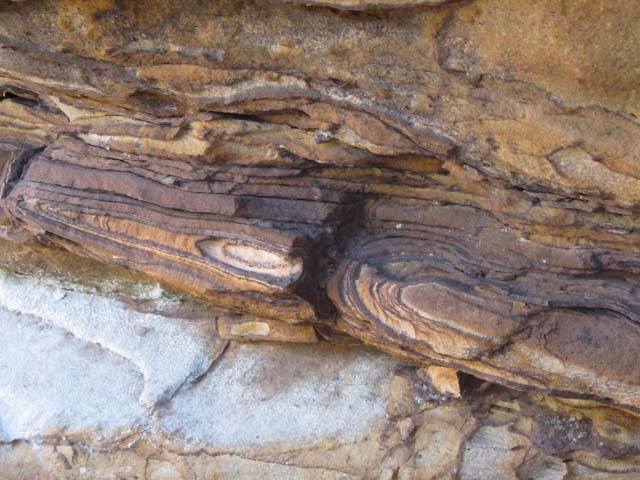 I will post more pictures of these banded rocks in the second blog on Saturday and the third Sunday. Buffy and I walked along a single lane country road until we came to a gate at the end of it. We veered off into the woods and gradually went down hill. Then the hill dropped more … and then more. I hadn’t hiked here in a long time and ended up taking the long way down the hill as it grew steeper and rockier. We were greeted as we came around and under a small overhang. He was a friendly-looking spirit. I couldn’t believe how many times I’ve sat under the overhang just to the left of him and never noticed how the rocks looked like a head! 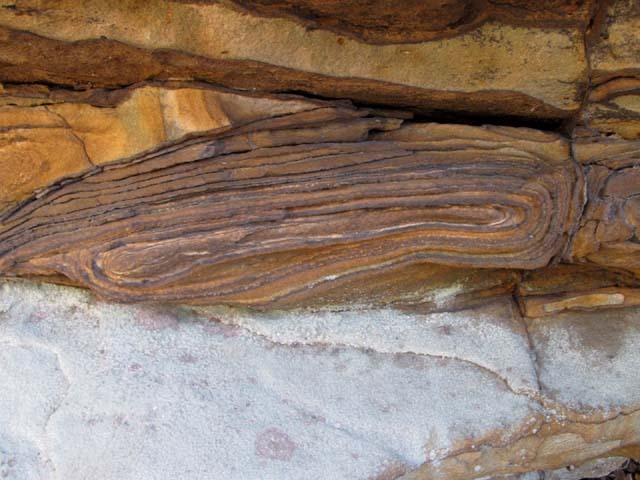 Sandstone with iron banding created so many different patterns. 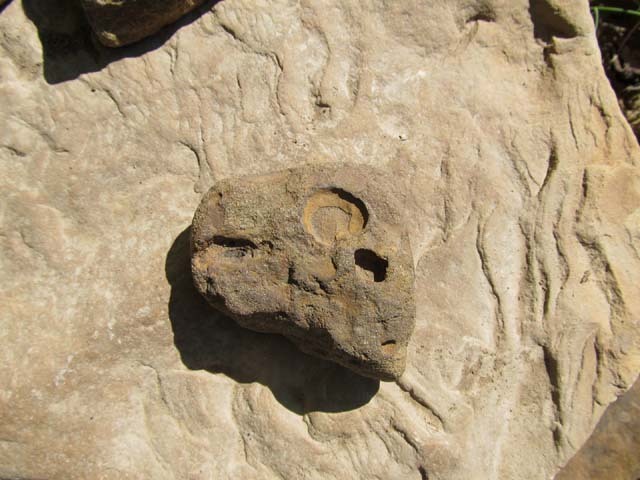 The softer sandstone eroded away, leaving the iron patterns. 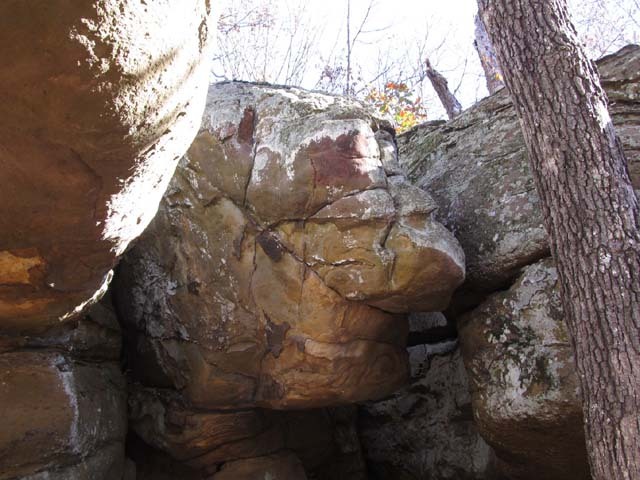 These are called liesegang bands and are common in certain areas of southern Illinois. It would be interesting to know exactly what caused the resulting patterns. Buffy took time from her exploring to enjoy the scenery, while I took pictures. 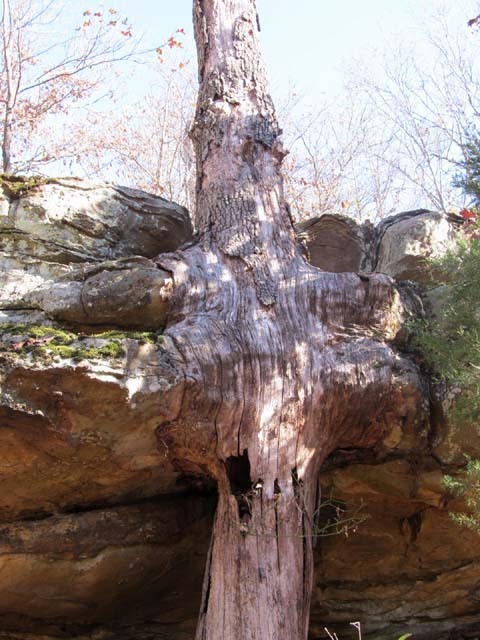 Obviously, this tree had a challenging life growing against the ledge. It’s been dead a long time. The top was gone and the trunk hollow. 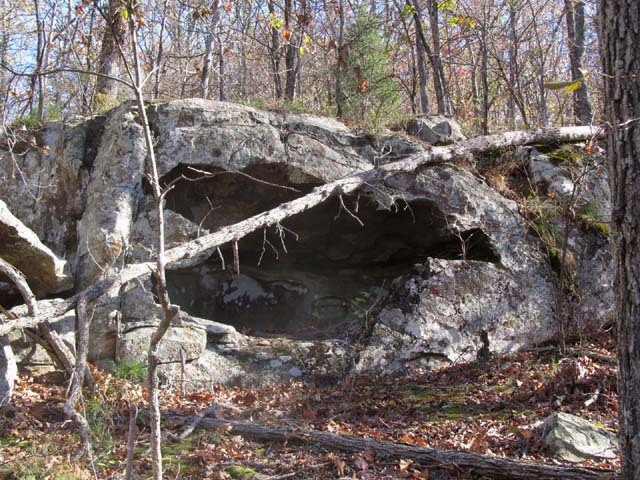 Knocking with my fist on the hollow area above the hole produced deep drumming sound. It wasn’t very loud but still enjoyable. 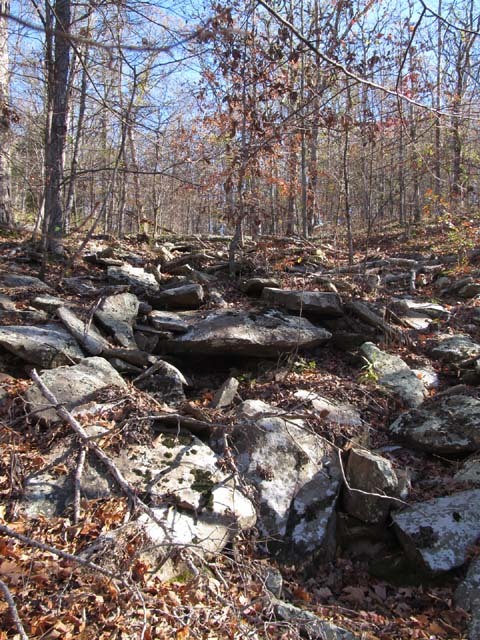 This row of rocks was just above the short bluff below where we had just been. This cavity was so big that my best friend and I both sat in one time, facing each other. 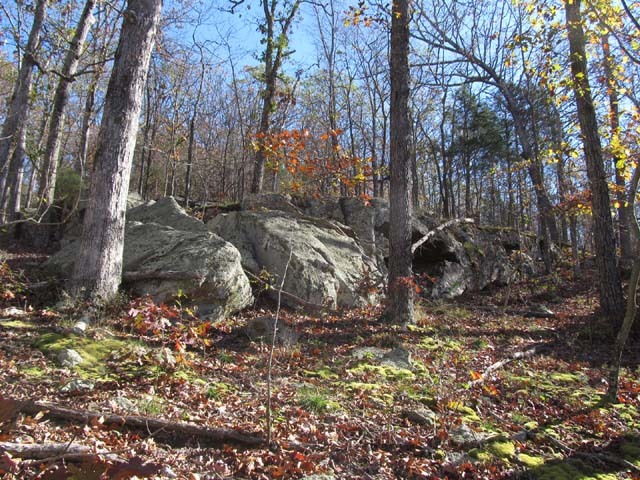 This shows the line of rock and the small boulders at this end. The word dramatic describes this whole area. It’s hard to tell from this picture, but I was standing in a water course where water runs off during heavy rains. To say the hill is steep is an understatement. Walking was difficult in this whole area because of the up and downs, and all the rocks. The hill dropped off dramatically from just below where we were most of the time. 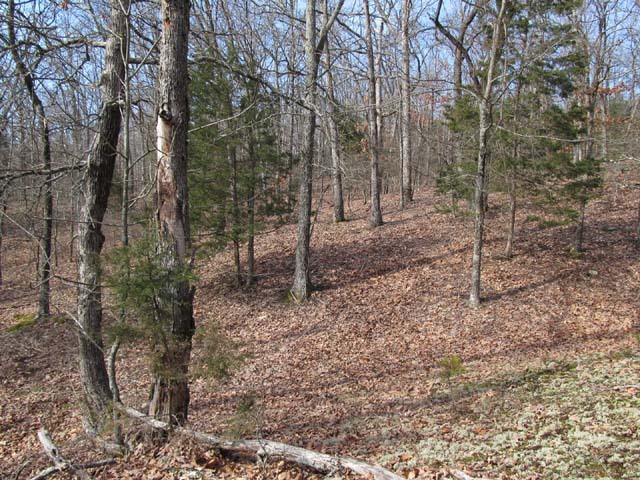 According to a topo map, it sloped downward 80-100 feet into a narrow ravine. We didn’t go down. I took one last picture before starting the hike back to the truck. Lunch sure tasted good when we got home after that strenuous hike. A short nap sure felt good. That’s how you know you had a good day.